The book released to mark Buddy William's 100th birthday celebrations and raise money for the Don Dorrigo and Guy Fawkes Historical Society. YOU'VE seen the show, now read the book as celebrations for Buddy Williams' 100th birthday continue in Dorrigo. 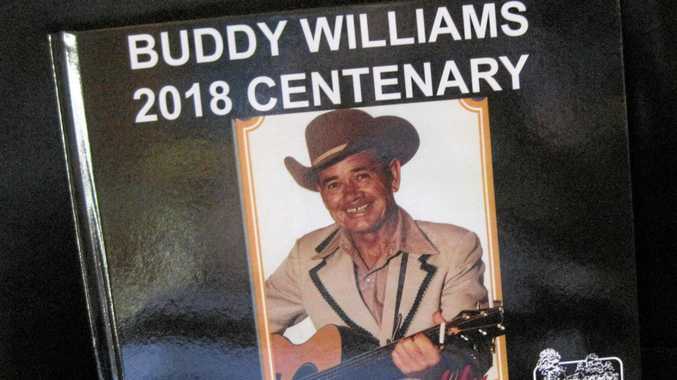 In September last year, the Don Dorrigo and Guy Fawkes Historical Society put together a whole weekend of celebrations to mark what would have been the 100th birthday of one of the region's favourite sons - country music pioneer Buddy Williams. The event attracted a large crowd from all over the North Coast and now, to celebrate its success, a book about the event has been released. Historical society vice-president Georgie Frogley said the book covered all of the major events of the weekend, in front of and behind the scenes, and not only commemorated the occasion but would also help with running the region's museum. "The sale of our books supports the running of our museum...keeps the door open and the lights on," Georgie laughed. And since they had so many great pictures and memories, the historical society decided that a book of the event would not only mark the occasion but would be a nice keepsake for everyone taking part. 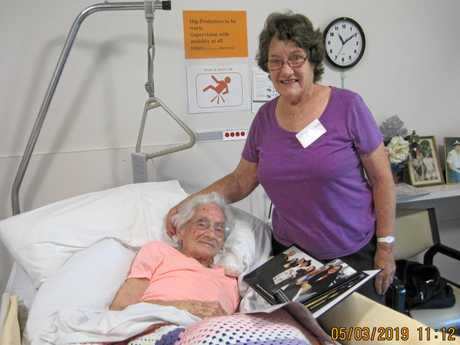 Nancy Pitkin with her 100-year-old mother Ina Smith, who is reading the page in the book that shows Karen Williams, Buddy's daughter, visiting Ina in Highview in September 2018. Ina made Buddy his pair of long trousers back when he came to live in Dorrigo. Harold "Buddy" Williams, who died on December 12, 1986, was born Harry Taylor on September 5, 1918, in Newtown, Sydney, and was soon placed in the Glebe Point Orphanage. After many failed escape bids as a child he was fostered out to a dairy farming family at Dorrigo where he learned to love the area. He first sang professionally at the Grafton Jacaranda Festival in 1936. His first recordings were made in 1938, a private process disk. The two songs recorded at this session were Where The Jacarandas Bloom, and They Call Me The Clarence River Yodeller. The latter song was reworked and called They Call Me The Ramblin' Yodeller and recorded during his first EMI session in 1939. "The book features photographs from the 100th birthday party held in memory of Buddy Williams at Dr Guymer's Waterfall Way Gallery on September 5 - Buddy's actual birthday," Georgie said. "Setting up for the Buddy Williams concert involved many local people and they are featured doing the 'behind the scenes' jobs. "On the day of the concert, The North Dorrigo Pony Club entertained us with their tribute...a musical ride to one of Buddy's songs...there's 'Music in my pony's feet'. "There are also some great photos of Arnold and Shanlee Duckett and Christine O'Rourke. Brian Fahey cracked the whip adding to our pre-concert entertainment." She said other events covered in the book included the big live concert on the Saturday night and Member for Oxley Melinda Pavey and Buddy's daughter Karen Williams unveiling a plaque on the rock in front of the museum and declaring Dorrigo to be "The Home of Buddy Williams". "Featured on the back of the book is Wayne Burley's poem 'Centennial Tribute to Buddy Williams'," Georgie said. "Orders are being taken now...the first lot sold like hot cakes." Phone Georgie Frogley on 0266572120 or order at the museum. The Dorrigo Museum is open Wednesday, Saturday and Sunday 10am-2.30pm.